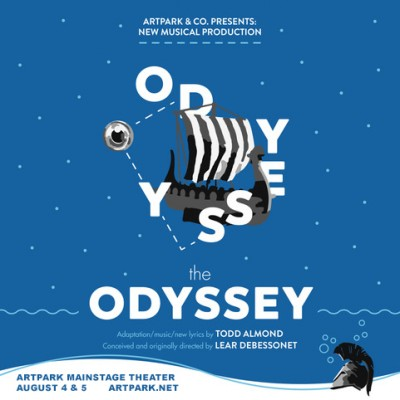 Travel with us on a story of high adventure and true love as 100+ WESTERN NEW YORK CITIZENS join BROADWAY STARS, PROFESSIONAL ACTORS, STUDENTS OF THE ARTPARK THEATRE ACADEMY and REGIONAL PERFORMANCE GROUPSonstage to create beautiful and dangerous world of THE ODYSSEY. A theatrical celebration for the whole family, this MUSICAL ADAPTATION of Homer's epic tale will bring our entire community together. Inspired by the nationally recognized program PUBLIC WORKS built by New York City's Public Theater, the program seeks to engage audiences in new ways by making them CREATORS AND NOT JUST SPECTATORS. Working with community‐based organizations, ARTPARK invites a WIDE DIVERSITY OF PEOPLE to participate in workshops and classes, attend performances, and to join in the creation of an ambitious work of PARTICIPATORY THEATRE led by working theatre professionals.